Teknisk set er SoundSticks Wireless-systemet ”multimedie”, mennår du hører det, vil du indse, at det nemt kunne blive dit primære lydsystem.Med 40 watt forstærkning, der giver fyldig og realistisk lyd, tilbyderSoundSticks Wireless stærk baslyd, som får al din musik til at lyde fremragende– uanset hvilken kilde der genererer musikken. Og med SoundSticks Wireless’nedadrettede subwooferforstærkere, der passer til satellithøjtalerne, kan duvære sikker på, at hver enkelt højtaler leverer en konsistent, optimal ydelse. Vi kan lige så godt se i øjnene, at de fleste af vores enhederer Bluetooth-kompatible. Og vi bruger dem ikke kun til musik – vi ser film,spiller spil og får adgang til socialt indhold. Ved hjælp af avanceret trådløsHARMAN TrueStream™-teknologi kan du tilslutte SoundSticks Wireless til dineenheder, der understøtter Bluetooth, f.eks. din tablet, telefon, MP3-afspillerog bærbare computer, for at få den bedst mulige trådløse lydkvalitet fra al dinlyd, ikke kun din musik. Og det skifter automatisk til Bluetooth-systemet, nårdin lydenhed er tilsluttet og i gang med at afspille. Så uanset om du arbejderved dit skrivebord eller streamer musik, mens du ligger henslængt på dinkomfortable sofa i den anden ende af rummet, vil du stadig opleve den sammeførsteklasses Harman Kardon-lyd, som du elsker. HARMAN TrueStream™-teknologien er vores garanti for, at du vilfå den bedst mulige lytteoplevelse, når du streamer trådløst viaBluetooth-teknologi. Fordi der er mange tilslutningsmuligheder, når det drejersig om Bluetooth-teknologi, anvender vores teknikere altid den nyeste og mestavancerede for at sikre lyd af den bedst mulige kvalitet, uanset hvilkenapplikation eller kildeenhed du bruger. Ikke mange multimedielydsystemer kan prale af, at deresforgænger er en del af den permanente samling på New York Citys Museum ofModern Art (MoMA), men det er præcis, hvad SoundSticksWireless-højtalersystemet kan. Det nye SoundSticks Wireless’ udseende udvikler forgængerenslovpriste design yderligere – det er banebrydende med en moderne industrielæstetik, elegante sorte betoninger og en selvlysende hvid lysdiodeglød. Ogselvom SoundSticks Wireless-systemet måske ligner en gæst fra fremtiden med detransparente højtalerdæksler, gør den enestående ydelse det til en mere endværdig efterfølger til det oprindelige, berømte SoundSticks-system. Selvom du har masser af sange på dine Bluetooth-enheder, betyderdet ikke, at al din musik er dér. Så vi har sørget for, at SoundSticks Wirelesser kompatibel med andre lydkilder. Takket være dets 3,5-millimeterstereolydtilslutning kan du bruge SoundSticks Wireless-højtalerne med næstenalle enheder, der har stereolinjeniveauudgange. Ved at tilbyde dig dennebrugervenlige mulighed er SoundSticks Wireless mere end bare en flotnyanskaffelse til dit skrivebord, din boghylde eller dit underholdningscenter.Det gør også dit liv enklere med en maksimal mængde tilslutningsmuligheder – oget minimum af ledninger. SoundSticks Wireless-systemet gør det nemt for dig at interageremed dets subwoofer og satellithøjtaler-”sticks” ved at have følsommetouch-knapper til at øge eller reducere systemets lydstyrke eller slå lydenhelt fra. Denne intuitive designfunktion reagerer på en blid berøring, hvilketgør dit SoundSticks Wireless-system nemt at betjene og holder dettelydkunstværk i den bedst mulige stand. Smuk lyd kræver ingen ledninger. I næsten 60 år har teknikerne hos Harman Kardon® designet nogle af verdens mest efterspurgte højtaler- og forstærkersystemer til lyd i hjemmet og bilen, herunder SoundSticks® 2.1-kanals højtalere til skrivebordet – det eneste lydsystem, der er permanent udstillet på New York Citys Museum of Modern Art (MoMA). I en vedvarende indsats for at gøre det ypperste endnu bedre opgraderer Harman Kardons teknikere nu dette kunstværk til en trådløs udgave: SoundSticks Wireless. SoundSticks Wireless er nu endnu bedre til at levere enestående lyd i en smuk indpakning med en 6" subwoofer, otte drivere med fuldt område, 40 watt forstærkning og touch-knapper til justering af lydstyrken – og med integreret Bluetooth®-teknologi som en ekstra fordel. Så uanset om du arbejder ved dit skrivebord eller ligger henslængt på sofaen i den anden ende af rummet, kan du stadig opleve fantastisk lyd fra musik, film, spil og podcast fra en hvilken som helst enhed, der understøtter Bluetooth – f.eks. din telefon, tablet, MP3-afspiller eller computer. Det er i sandhed ydelse, når den er bedst. SoundSticks Wireless is rated 4.5 out of 5 by 207. Rated 5 out of 5 by kiwizulu from Fantastic System for my computer! 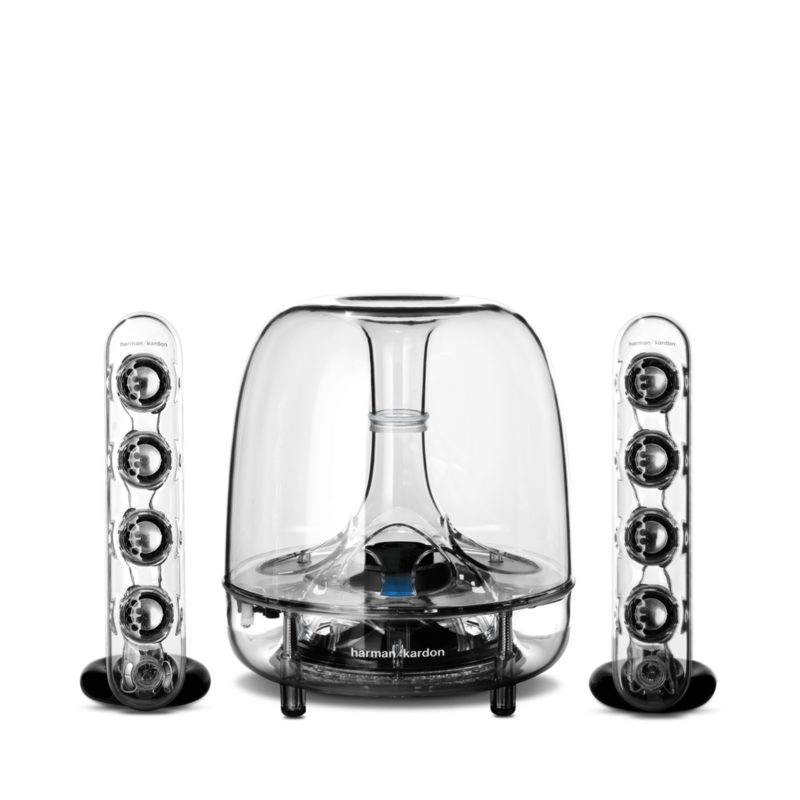 I bought the "recertified" version of these speakers as they were within my budget. Was a little concerned as I wasn't sure what to expect from recerified stock. The product I received was in all its original packaging and as far as I could tell there was absolutely no difference to a brand new one you would pick up in store. All speakers and cables carefully wrapped and no damage/scratches, etc... Set-up was a breeze with all the included documentation and the sound quality absolutely amazing! I would definitely recommend. I hope this answers any questions first time buyers, like myself, of recertified stocks have and puts any concerns to rest. Rated 4 out of 5 by 0007 from Beautiful design / Bold Sound I have been listening to classical and jazz on the sound sticks for a month and I am very impressed with its musicality. They fill a small room with clear crisp sound in the mid and high range and the sub woofer provides plenty of base notes. I would prefer the volume to be a dial switch and the power button to be located on the left or right channel speakers rather than on the sub woofer unit. Also the blue tooth and power on indicator lights would be better if both could be turned off for those people who want to fall asleep listing to music. That being said, I would recommend the sound sticks to anyone who appreciates design and music in the same space. Rated 5 out of 5 by Trevschulze from Best speakers you can buy for under $500 I've looked at just about every available set of speakers you can buy for under $500. As a best buy employee, I have access to tons of choices and can demo any speaker system I wish. After thoroughly testing many speakers. I decided to try the HK SoundSticks. I wasn't disappointed. They offer crystal clear sound at any volume. Although there are only 2 speakers and one small sub, the 4 drivers per speaker, deliver super powerful, high quality sound. They are loud enough to full any room or small apartment. The Bluetooth has surprising range and transmits even through walls and floors. Not to mention they look absolutely stunning. The futuristic and elegant design adds class to any room. Overall an incredible system at an unbeatable price. Rated 5 out of 5 by Alec from Great Speakers Initially ordered these speakers due to their looks, as well as the reputation of Harmon/Kardon, and all of the great products they produce; however, I was worried about the volume as it's meant for a desk next to the computer. Once I plugged these speakers in my worries went away as my entire living room, bedroom, and kitchen filled with crystal clear sound, along with the shaking of the sub. Not only do these speakers look awesome, but their sound is even better, I would recommend to anyone on the fence about these speakers. Rated 5 out of 5 by MrRicearonie from Great Price, Amazing Sound What can I say about the Sound Sticks besides they are amazing! Great compact design for showing them off, or hiding them behind your monitors. The Bluetooth as amazing range and clarity for a Bluetooth speaker, defiantly worth the premium over the Sound Stick III. And the sound, it is amazing what you can get from the tweeters on these speakers. Sure the mid range is not the best, but it is not the worst. The sub is nice and subby and the audio clarity is top notch. Good jib Harmon Kardon! 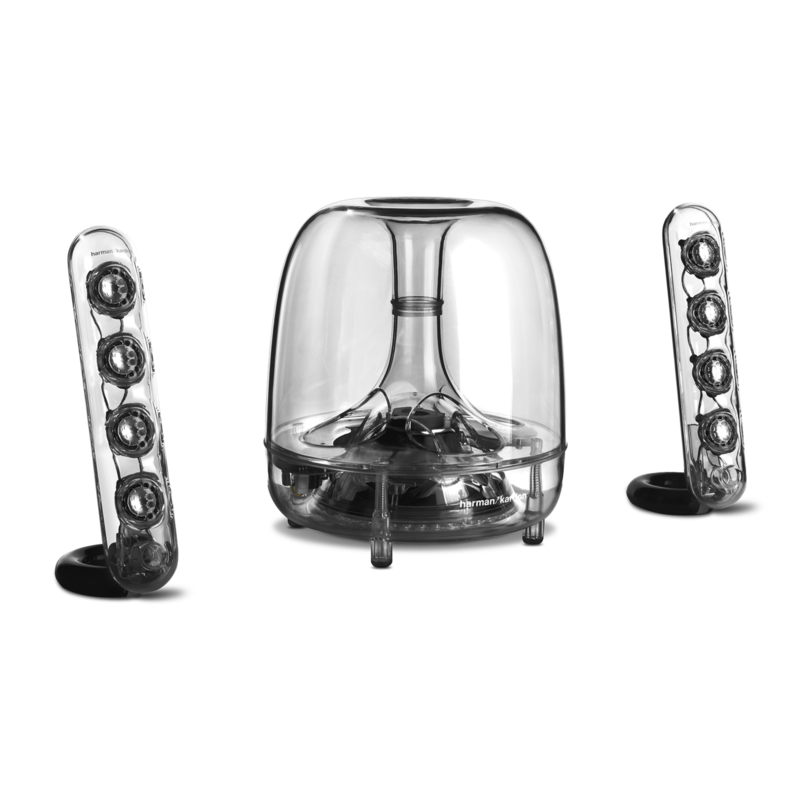 Rated 5 out of 5 by Sound StickMan from Nice sound Sticks Great speakers for a computer system. The only negative feature is the power button being on the back of the bass speaker which is under my desk by recommendation. Makes it a pain to turn on and off. That's is though. I have not had any trouble with the neighbors blu-toothing to my system. Thanks for getting in touch with us. Yes, there is a wired connection between the sticks and the sub woofer. The wireless part of this product refers to the connection with the source device, for example a phone or tablet. If you need further assistance, please submit a case request at https://www.harmanaudio.com/support-contact.html and the Customer Service Team will be more than happy to assist you. Can you connect an Echo via bluetooth as well as a turntable via 3.5 millimeter connection? Yes, you may connect the Soundsticks Wireless to Echo via Bluetooth however, you may not be able to connect a turntable via 3.5mm jack if it does not have a built it phono pre-amp. Also, it may not give you the desired sound since Soundsticks Wireless is mainly designed to be used for streaming. Is this the newest version of soundstick wireless? Hello! Unfortunately, no because the Soundsticks wireless does not have any feature that will allow it to connect to another speaker. 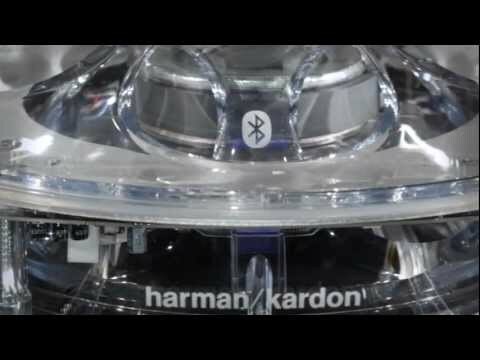 We would like to work with you directly.&nbsp;Please submit a case request at&nbsp;https://www.harmankardon.com/support-contact.html&nbsp;and the Customer Service Team will be more than happy to assist you. I am looking to use this for a home audio with movies and tv, mainly sporting events and movies. Do you think these will be powerful enough to fill a room as I&rsquo;ve noticed most people use them for computers. how far can the speakers be from the subwoofer? Hello! The satellite speakers can go up to 4ft away from the subwoofer. does high frequency hum from woofer indicate non-fixable problem?